The Ecumenical Accompaniment Programme in Palestine and Israel (EAPPI) is an ecumenical initiative that supports local and international efforts to end the Israeli occupation and bring the Israeli-Palestinian conflict to a resolution based on international law and United Nations resolutions. The EAPPI volunteers offer protective presence to vulnerable communities, and monitor and observe that international humanitarian law is respected and human rights are fulfilled in the occupied Palestinian territories. An increased number of house demolitions in West Bank reflected in the work of the volunteers in 2016. There was more emphasis on visiting the communities that had received demolition orders and on making incident-reports after the demolitions had taken place. The EAs cooperated with visiting diplomatic missions and NGOs, helping the locals draw attention to their situation. After the deployment period the EAPPI volunteers do advocacy work mainly in Finland. In 2016, EAPPI focused on growing its visibility in social media, especially Facebook and Instagram, with good results reaching thousands of viewers more than the previous year. 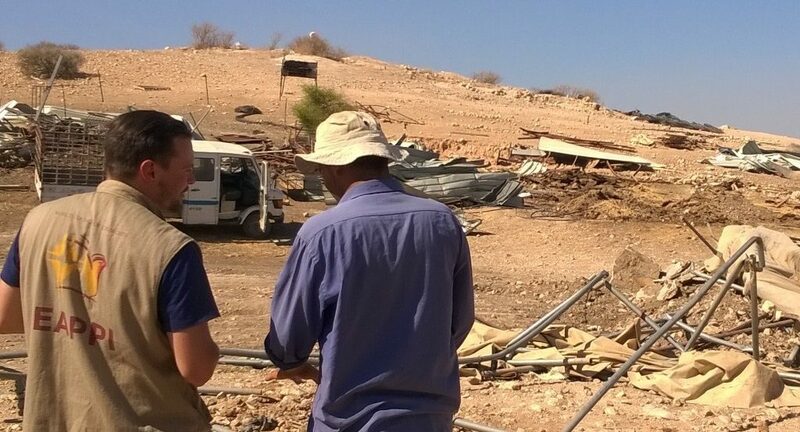 In the spring and summer of 2016, an advocacy campaign was launched to shed light into the increasing number of house demolitions in the West Bank, with an appeal for Finnish decision makers to act to prevent the house demolitions. The campaign was visible in the World Village festival in Helsinki in May 2016 and in social media, and it was recognised by the Minister for Foreign Affairs of Finland, who sent a response letter to EAPPI.